The view to the west from Little Bluff Lookout, Salt Cay. The Little Bluff Lookout cannon from the 1790's HMS Endymion Wreck. 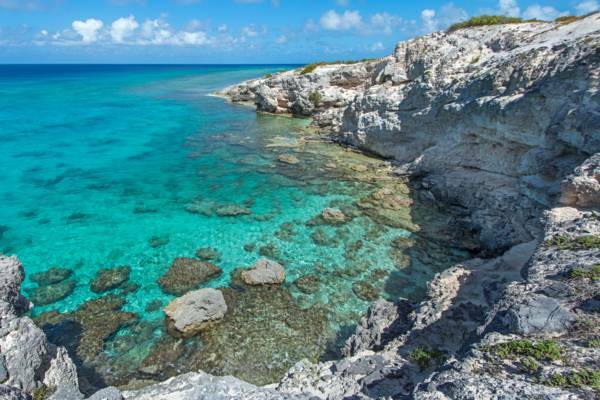 This 52 foot (16 meter) marine limestone hill is found a short hike north of Deane's Dock in Balfour Town, Salt Cay. Spectacular views can be had over Balfour Town, the salinas, and North Bay. It’s often possible to spot cruise ships heading to Grand Turk, and during the winter months, the bluff is an excellent whale watching site. A cannon from the 1790 HMS Endymion Wreck, ruined light towers, and the foundation of a small building can be found at the summit. Decent snorkelling can be found below the soft and crumbling limestone cliffs. As is common to many eastern coastlines in the Turks and Caicos, the hill and cliffs of Little Bluff Lookout consist of semi-lithified marine limestone. This rock was essentially formed from sand dune, which was collected by the action of the wind. To get to Little Bluff Lookout, simply follow the coast north about a third of a mile (.6 km) from the main dock on Salt Cay. A sandy path leads up the hill to the overlook. 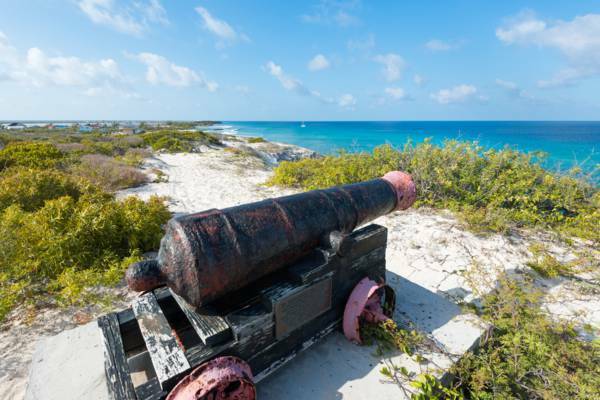 After leading to the summit with the cannon, the hiking path continues to the north to North West Point and the exquisite North Bay Beach. The vivid ocean off of Little Bluff Lookout, Salt Cay. Last reviewed by an editor on 14 June 2017.